The Gwinnett Gladiators came up just short of sweeping a home-and-home with Greenville last week. 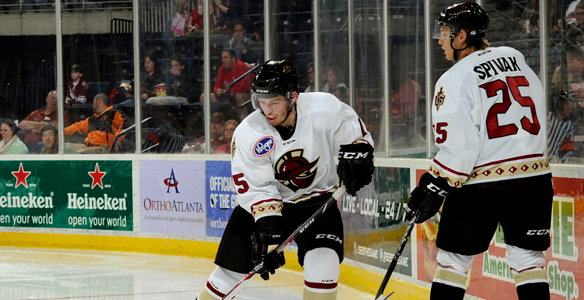 In the first game at home on Friday, the Gladiators demolished the Road Warriors 7-3. The score was tied 1-1 after the opening period, but the Glads scored three goals in both the second and third to pull away. Forward Mike Merrifield scored two goals and Eriks Sevcenko tallied four assists to lead Gwinnett to the lopsided win. Merrifield and Sevcenko were acquired by the Gladiators in a trade for fan-favorite Evan Bloodoff and Rob Kwiet back on March 12. In the 11 games since the trade, Merrifield has six goals and five assists. Sevcenko has seven assists. Of note, when the Gladiators are leading after two periods, their record is 20-0. They did not have the lead after two periods when they traveled to Greenville one day later. The 4-3 contest was competitive in just about every department, with each team putting 34 shots on goal. Dirk Southern scored his 16th goal of the year and the Northern Michigan University product now has 38 points for Gwinnett this season. The Glads came up just short of tying the game in the waning moments with their goalie pulled for the sixth attacker. Defenseman Justin Weller was reassigned to the Gladiators from the AHL’s Portland Pirates last week. Weller played in three games for Portland after being called up on March 8. The 22-year old appeared in 41 games with Gwinnett this year, scoring two goals and adding seven assists. The Alberta native also has 34 penalty minutes while managing to stay on the plus side with a + 2 rating. The move for Weller also meant the release of defenseman Nolan Descoteaux. It has been a long and at times frustrating season in Gwinnett. However, the Glads have been playing their best hockey of the year over the past month and are looking to end the season positively. The team is playing its final two games of the year against Elmira this week at home. Wednesday’s result was not avail- able at press time, while the finale will come on Saturday. The Jackals head into Gwinnett having lost 12 of their last 13 games. These are two games Gwinnett can win and should win for all the fans who have stuck with the team throughout this season.